The initial impression (appearance) of a ruptured ectopic pregnancy is most commonly that of "a lot of blood in the pelvis and abdomen." If a woman with a ruptured ectopic pregnancy is hemodynamically stable and otherwise a candidate for laparoscopy, then laparoscopy is not contraindicated. An experienced laparoscopic surgeon can usually remove the blood and blood clots that have collected quickly and easily. 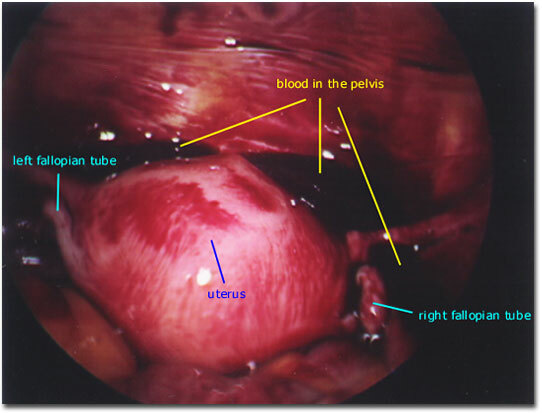 This patient had a bilateral tubal ligation about 4 years prior to this ectopic pregnancy. Her history of an apparently successful bilateral tubal ligation several years prior to an ectopic pregnancy and the sudden onset of severe pelvic pain brings home the importance to "always consider ectopic pregnancy" as a possible cause of pelvic pain in any reproductive age women.